The water supplied by the glaciers of the Cordillera Blanca, vital to a huge region of northwest Peru, is decreasing 20 years sooner than expected, according to a new study. Water flows from the region’s melting glaciers have already peaked and are in decline, Michel Baraer, a glaciologist at Canada’s McGill University, told Tierramérica. This is happening 20 to 30 years earlier than forecasted. “Our study reveals that the glaciers feeding the Río Santa watershed are now too small to maintain past water flows. 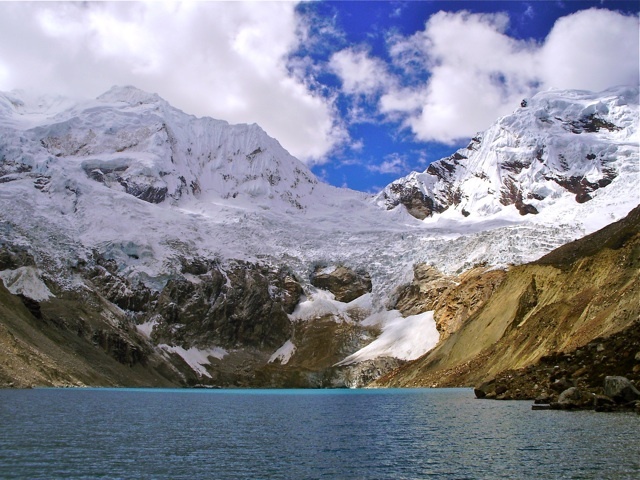 There will be less water, as much as 30 percent less during the dry season,” said Baraer, lead author of the study “Glacier Recession and Water Resources in Peru’s Cordillera Blanca”, published Dec. 22 in the Journal of Glaciology. When glaciers begin to shrink in size, they generate “a transitory increase in runoff as they lose mass,” the study notes. Part of the South American Andes Mountain chain, the Cordillera Blanca is a series of snow-covered peaks running north to south, parallel to the Cordillera Negra, located further west. Between the two ranges lies the Callejón de Huaylas, through which the Río Santa runs, eventually emptying into the Pacific Ocean. 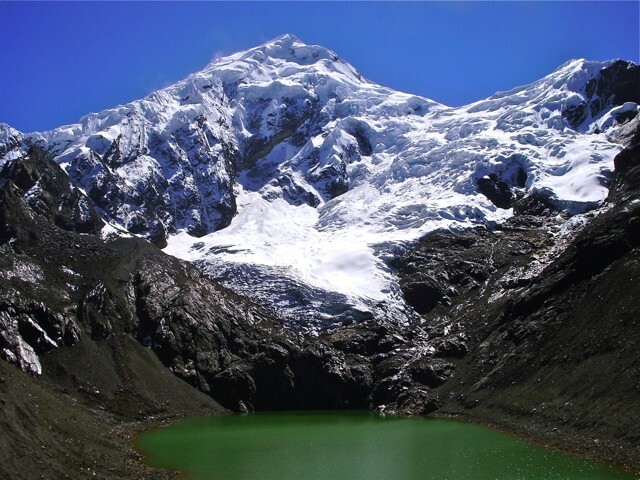 The tropical glaciers of the Andes Mountains are in rapid decline, losing 30 to 50 percent of their ice in the last 30 years, according to the French Institute for Research and Development (IRD). Most of the decline has been since 1976, IRD reported, due to rising temperatures in the region as a result of climate change. In Bolivia, the Chacaltaya glacier disappeared in 2009. Even in the colder regions of the Andes glaciers are in full retreat. Chile’s Centre for Scientific Studies reported this month that the Jorge Montt Glacier in the vast Patagonian Ice Fields receded one entire km in just one year. Historically glacial retreat is extremely slow: one or two km per 100 years. Melting glaciers around the world present some of the strongest evidence that global climate change is underway, said Lonnie Thompson of Ohio State University, the world’s foremost glaciologist. Thompson warns that without sharp reductions in the use of fossil fuels, the impacts of climate change could come faster and beyond what humanity can adapt to. Warmer temperatures not only melt ice but also have major effects on snowfall. As cool seasons become warmer and snow turns to rain, the amount and duration of snow packs decrease and the permanent snow line moves upslope, according to the Inter-American Institute for Global Change Research (IAI), an intergovernmental science organisation based in São José dos Campos, Brazil. These changes have significant effects on the seasonality of stream flows, increasing winter flow rates while the availability of water during the summer declines when water in streams and rivers comes mainly from snow and ice melt. The Cordillera Blanca has the most glaciers of any tropical mountain range in the world. In the 1930s glaciers covered up to 850 sq km of the region and now they cover less than 600 sq km, reports Baraer and the eight other study authors from McGill University, Ohio State University, the University of California, the IRD and the glaciology unit of the Peruvian National Water Authority. Most of the melt water from these glaciers drains into the Río Santa watershed. The researchers compared detailed water flow measurements from the 1950s to water flows in recent years, and determined that of the nine sub-watersheds of the Río Santa, seven have passed their peak water flow and are in decline, and almost all of the decline is during the dry summer months. Changes in precipitation and the effects of La Niña and El Niño were also assessed and were not responsible for the declines, Baraer said. Until now it was widely believed that such declines would take place 20 to 30 years from now, allowing time to adapt to a future with less water. “Those years don’t exist,” said Baraer. The region is extremely dry, and the Callejón de Huaylas and especially the agriculturally important province of Carhuaz are completely dependent on water from the Río Santa to irrigate the extensive fruit and vegetable fields, he said. The Río Santa is also the main source of drinking water for cities in the area, as is the case of many rivers in the Andean region. For instance, Lima, the world’s second largest desert city after Cairo, depends on water from the Río Rímac watershed, also in the Andes. “The northern Andes (in Peru) are close to being a desert. It is the water from the glaciers that has allowed people to survive here,” Baraer said. Last summer, researchers took measurements of the Río Santa’s water volume from the estuary where it reaches the Pacific all the way up to its sources in the Andes. They found that less than 20 percent of the water reaches the ocean now. “Eighty percent of the water from the Santa is already being used,” he said. Projections into the future reveal that in the coming decades some Río Santa sub-watersheds will have 30 percent less water – a serious challenge to the entire region when 80 percent of current volumes are already being used, Baraer stressed. “This water decline is guaranteed. The only question is how much and how quickly,” he said. 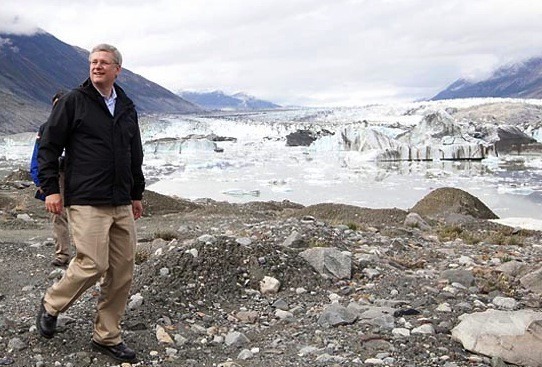 There is already so much carbon in the atmosphere from the burning of fossil fuels that it is “already too late for most of the glaciers in the Andes,” he concluded. First published as PERU: No Time Left to Adapt to Melting Glaciers – IPS ipsnews.net. What is really important are the comparable volume figures, which I suspect are significantly worse (since most glaciers are thinning as well as retreating).